This time around I did not spend a lot on make ups. 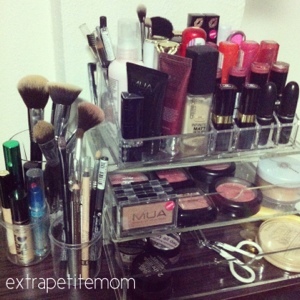 I do, however bought a clear makeup drawer from Ramona. Luckily she still had her drawers displayed in Parkson Pavilion so I got the chance to view it before I decided to buy it. The two level drawer cost RM70 while a similar one available in Muji is RM90 so that's a bargain in my opinion and the the quality is of the same. On top of that I also bought Simple facial wipes and NYX blush in dusty rose (my everyday blush at the moment!). I was looking for Dior lipstick in Guipure but it was not available anywhere. I mostly spent on baby Iqbal's clothings, few tops and flats for myself, work shirts for dear Husband and few other bits and pieces.